You can configure the table row settings in the Alerts table. You can use this feature to modify the appearance of the Alerts table and the refresh rate. Click the (slides icon) at the top of the table to display the Settings dialog box. To modify the rate at which the Alerts table is refreshed with new alert information, choose a value under Refresh Rate. To modify the number of rows displayed in the Alerts table, choose a value under Rows Per Page. The number of rows that are visible in the Alerts table is restricted by the size of your browser window. To hide resolved alerts or dismissed alerts, click the slide button next to the appropriate action. 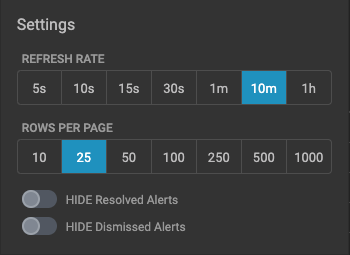 HIDE Resolved Alerts and HIDE Dismissed Alerts are non-functional features in this release.